Monitor temperature and humidity over long distances with ease. Banner's SureCross temperature and humidity monitoring solution provides a simple way to verify conditions in locations that were once too difficult to access via traditional monitoring methods. With no software required, you can replace cables and extend the range of temperature and humidity signals with minimal effort. 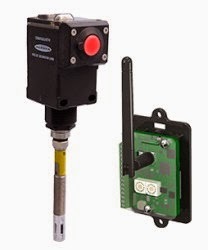 Banner's SureCross Temperature and Relative Humidity Sensor Solution provides reliable wireless environmental measurements without the need for costly wire runs to the monitoring point(s).